At the moment Ms. Izzy is alternately attacking her Leapfrog table and dancing to the music coming from it. She has quite the cute booty shake! We've started decorating for Christmas (no tree yet) and she loves the lights (which translates to she wants to eat them!). She loves all the singing animals that were Catie's and she wants them singing non-stop. The really funny thing is her grunting and protesting when they quit singing. She has a new wrinkly nosed facial expression that is absolutely adorable and can come out when she's happy or mad. Baby food is a thing of the past (even though she still only has 2 teeth). She won't touch the stuff and we're anticipating the switch to milk in a few weeks. She only woke up ONCE last night!!!!!!! She's discovered Catie's kitchen and though she's not pretend-cooking yet (though she will pretend to give you a bite of food), but she loves playing w/ all the stuff in it (translation: spreading it all over the kitchen and great room floors!). She's got several words (mama, dada, baby, book, papi, dog, Gaga, and a couple of others) and you can just watch her absorbing words as you say them. Her wave is quite exuberant and I'm quite certain it will give you a black eye if you get in the way of it. She still thinks chewing on paper is fashionable and will "run" from you when you need to do a mouth check! Obviously, she is keeping us on our toes and keeps us giggling! There is no rest when she's up and on the move and that's fine with us (so long as she lets us sleep at night!). Totally didn't plan to do Santa on this day, but there was NO line and the picture disc was half price (which is still outrageous! ), so we had to stop! We'll update again the next time we're not in chasing mode!! Jenny - She is beautiful - just like her big sister! We have a 3-1/2 year old girl and a 15 year old boy - yikes - it scares me when I see it written down. Emma was so much more 'curious' than Taylor ever was! Last year with her craft scissors she cut a few ornaments of the tree - I wonder what this year will bring. 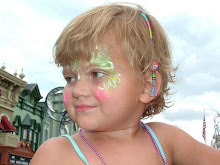 I hope the holiday season brings you peace and joy and many, many beautiful dreams of Catie. Jenny- Izzy is absolutely beautiful just like Catiebug! Thanks for sharing the picture of Miss Izzy and Santa. Love to you all this holiday season! What a sweet little smile! She is so cute. I love reading how she is enjoying sone of the same things and toys as Catie. Sounds like Izzy is keeping you on your toes. She is absolutely adorable. Looks alot like Catie bug. Love her picture with Santa. Hope that you all have a wonderful holiday. What a fantastic picture! She looks a little more like Catie each day...sounds like shes having a lot of fun and keeping you on your toes...praying for you during this Christmas Season.. I wanted to go to bed early tonight but once I watched the video with Izzy I had to watch it over and over (we are on dial up and it took ages to load), she is adorable, so cute! I loved her squeals and she's so funny with the doggy bit at the end!!! 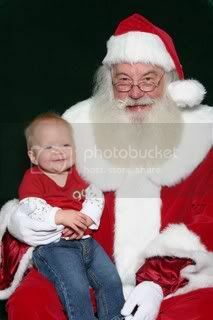 Love the santa picture too, she looks great in jeans, what a wonderful smile!! Love your sweet letter to Catiebug, she is surely watching over you and making sure you both and Izzy have lots of happy and fun times. Thank you so much for sharing little Izzy. Her grunt is hysterical. Braelyn did the same thing at that age. She is now 18 months. I thought she was the Exorcist or something. I watched the video twice and beamed from ear to ear the entire time. It brings me pure joy to see Catie in her. ABSOLUTELY BEAUTIFUL..... Oh, that hair, tha giggle, that total sweetness.... Praying that the Holiday Season will be a gentle and beautiful one for you as we remember the real reason that we are celebrating and thanking Jesus that we can be 110% sure that your Catie is with him. I love reading your "Izzy Stories". She sounds hilarious...much like my 22 month old son. He also keeps his family busy. I hope you and your family are having a wonderful Christmas season. She is looking so much like Catie to me.